Investigators say Dr. Lawrence Choy overprescribed the risky combination of an opioid, an anti-anxiety drug and a muscle relaxer. A New York doctor accused of overprescribing a combination of drugs known as the "Holy Trinity" — a dangerous cocktail of an opioid painkiller, an anti-anxiety pill and a muscle relaxer — has been indicted in the death of two patients. 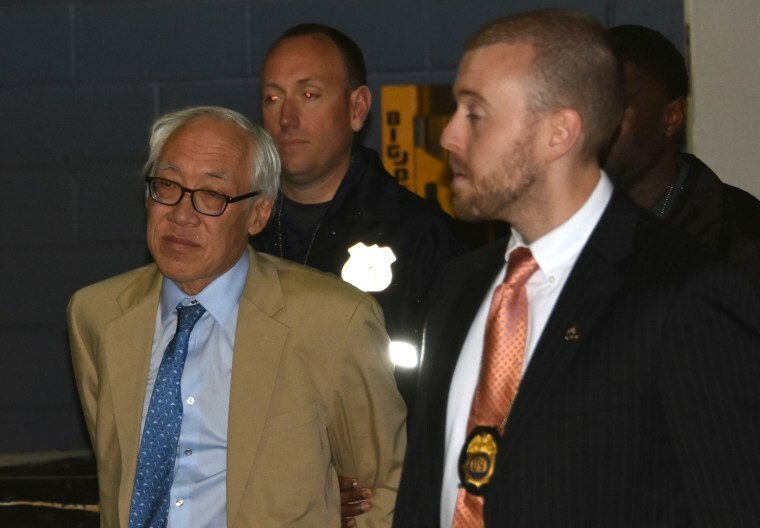 Dr. Lawrence Choy, 65, is charged with 231 counts ranging from manslaughter to the criminal sale of prescriptions. He was arrested in March at a house in Sheboygan, Wis., where officials say he moved once he realized he was under investigation. "After 30-plus years in law enforcement I never thought I'd see the day where doctors and drug dealers were interchangeable," James Hunt, the special agent in charge of the Drug Enforcement Administration in New York, said in announcing the charges. "It really pisses me off to see doctors doing this," Hunt said, while acknowledging that the vast majority of doctors are committed to patient care. Choy is charged with prescribing oxycodone and the anti-anxiety medication Xanax, and a muscle relaxer to Eliot Castillo, 35 and Michael Ries, 30, both of whom died within three days of their last visit to Choy. The DEA said the combination is favored by people who suffer from substance abuse as well as those who want to resell the prescribed pills on the black market. Because each drug depresses the respiratory system, the risk of fatal overdoses is high. The investigation showed that Choy, “personally observed the patients’ physical and mental states deteriorate, while disregarding reports about patients’ involvement in accidents, including motor vehicle accidents," the DEA said. Castillo received prescriptions for 680 oxycodone pills in a single month from Choy and even entered a drug treatment program during the 11 months that he was Choy's patient, investigators said. But the father of two relapsed and suffered a fatal overdose in February 2013. Choy also faces charges of reckless endangerment for the death of another patient, Daniel Barry, and eight living patients. The DEA said that Choy prescribed drugs to a man who was in jail and a woman who gave birth to two children during the course of her treatment. He was an internal medicine doctor with a practice in the borough of Queens when he was hit with delinquent tax bills for millions of dollars in 2012. That's when, officials say, he started to ramp up prescriptions for painkillers and then for the three-drug cocktail. The investigation began when the Pennsylvania Attorney General’s Office learned suspicious prescriptions issued by Choy were being filled in that state. The probe was conducted by the DEA, Homeland Security Investigations, the New York State Police, and the NYPD. New York Special Narcotics Prosecutor Bridget Brennan said that many of Choy’s patients were seeking legitimate pain relief when they went to his office and the prescriptions he gave them put them on the path to dependence. "Many of his patients were turned into addicts," Brennan said. Choy was scheduled to be arraigned in Manhattan Supreme Court on Thursday. His attorney did not return a call for comment.